What do successful business owners do when they live in New Jersey but love to weekend in Nantucket? Put a plane in the garage of course! Load up the plane on Friday afternoon, taxi it down the driveway, take off down the runway and have dinner in Nantucket! Not the most common residential development, but surrounding small private airfields with a few building lots is just the ticket for families on the move. 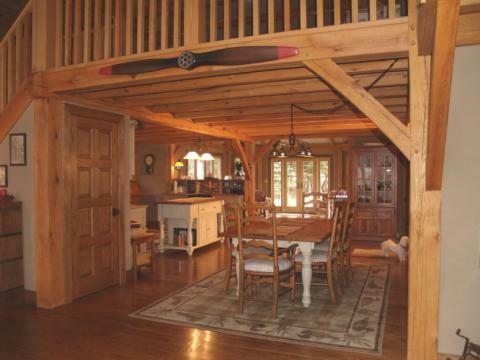 Our New Jersey couple’s dream home began by building a hangar first (a really big garage! ), big enough for the plane, the cars, building materials storage and oh yes, a place to camp out while construction of the adjacent house commenced. 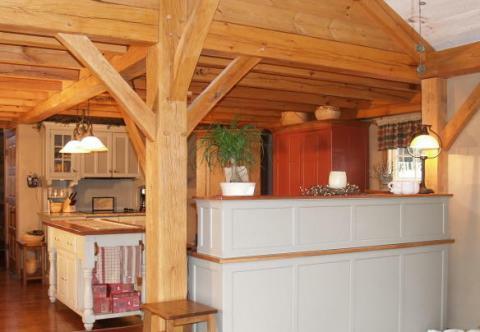 The heavy timber frame was cut and erected by the Hardwick Frame Company of Hardwick, MA, and after many months of finishing the new home, the owners finally moved in, leaving only the exterior landscaping and basement to finish. The personal touch of this exquisitely built heavy timber home are evident everywhere. The open plan post and beam interior (seen from the foyer above) is segmented only by ceiling height changes as the wood floors and ceilings continue from area to area. It was this open feeling that caused the owners to search for a kitchen solution that would furnish the wide open kitchen that could be seen from all the adjacent areas. 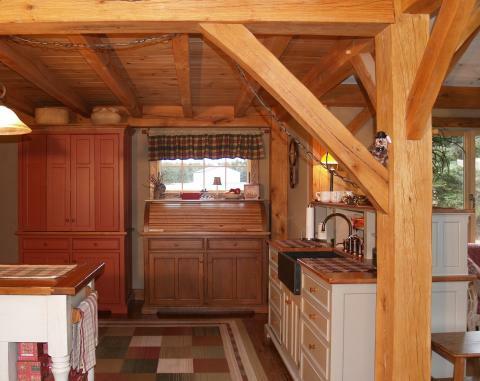 In addition, they did not want to cover up all the structural posts, beams and braces with wall to wall cabinetry. The center island and the dining table are furniture pieces that they already had and wanted to use in the new kitchen. To complement these pieces, they selected YesterTec’s Kitchen Workstation Furniture, specially built pieces that hide not only the hi-tech appliances, but some of the counter tops as well. As soon as the kitchen was finished, the painted Working Pantry / Baking Center was put to use as apple pies were prepared for everybody. Its marble top is great for rolling out dough and the bi-fold doors can hide the mixer and other small appliances as well. 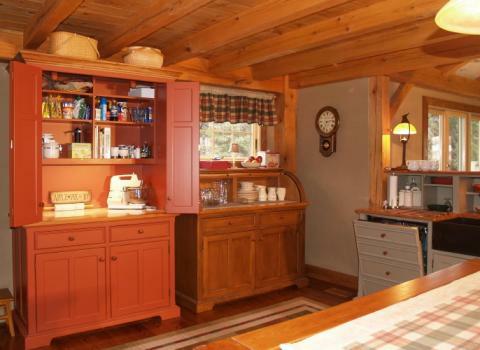 Next to the Working Pantry is the distressed pine Roll-top cupboard that contains a hidden countertop (in solid cherry this time) and lots of storage space below. The extra deep dimensions of the range, sink and roll-top cupboard allow for more abundant storage and countertop space than in normal kitchens. 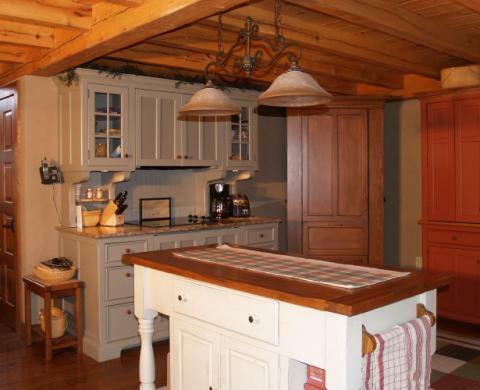 The painted Storage top above the Sink Workstation hides the messy counter tops from the family room, but still allows the cook to always see out to the view and converse with everyone. After washing dishes in Rubbermaid tubs for so long in the hangar, the integrated dishwasher and huge Soapstone sink are a welcome change. And the solid cherry tops are as durable as they are beautiful. The distressed pine Refrigerator/Pantry Workstation is placed at a 45 degree angle in the corner and features side opening, one-can-deep pantries on either side of the Subzero 700 series refrigerator/freezer. The painted Range features a hidden oven below the countertop and an all-purpose Advantium speed cook oven/hood above the cooktop. This piece features YesterTec’s U.L Listed technology that allows the appliances to work only when the flipper doors that hide the appliances are in the open position. The oven’s flipper doors actually lock in their pockets until the oven has had a chance to cool off! The painted flipper door panels are made of perforated aluminum panels that allow residual moisture and heat to circulate even when the doors are closed. The granite countertop allows hot pots to be placed directly on them. The variety of finishes, wood types, countertop materials and sizes and shapes of the workstations themselves adds to the warm feeling of the kitchen, a look that blends with the comfortable character that defines the other surrounding rooms. The Low-tech look of this very Hi-tech kitchen complements the Low-tech look of the entire timber frame home that also houses a very Hi-tech airplane. It is rare to see today’s fast paced technologies blend in so well with the look of Yesterday. But that is just what Gerry and Carol Heath have accomplished! Previous ArticleHiding Appliances: Visual Hypocrisy Solved!